President Selkie in 2016 ya’ll. This strip finishes the Big Ol’ Infodump story line. We’ll see the De’Madieas again later, they’re not one-time occurences. But for now, there’s other sotrylines to return to. 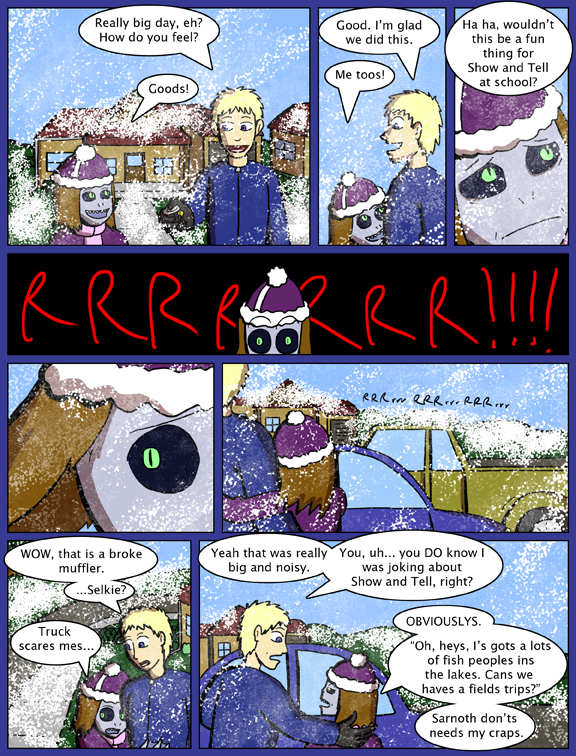 There's some pretty big continuity errors here that I didn't catch in time to fix (or if I did go back to fix them it would delay the comic to the point of a skipped update). Lets make a Where's Waldo game of it instead. I guess I’m no good at Where’s Waldo. I honestly don’t notice any continuity errors. I don’t think Todd picked up on WHICH truck scares Selkie. Hopefully agents Smith and Jones have neuralized the HELL out of him. Well, I guess that explaines the nightmare. A country within our country, technically she’s from Michigan. Also at least give her a bust or shadow powers in the background, make the people vote from fear or love. No, she has citizenship papers. 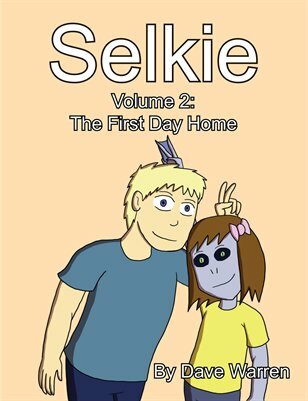 https://selkiecomic.com/comic/selkie101/ That means she is naturalized, which means she is not “native-born American”. If they raised enough of a stink with Congress, she could probably be retroactively given status similar to that of Native Americans, though. On the second thought… we have enough of a problem with a president with brown skin. Is America ready for a periwinkle president? Not wanting to start a political argument but I doubt it’s really just his skin color that’s causing the problems. Selkie is back… as the super-powered leader of the Saints! Run, Truck, run!